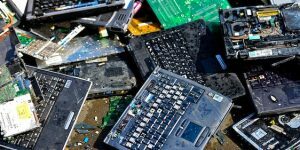 Computers are an essential part of everyday life, but as they and other digital devices become obsolete increasingly rapidly, we are confronted with the rising concern that our e-waste is not being disposed of environmentally correct. 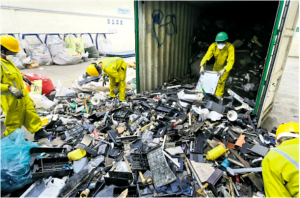 Electronic goods thrown into landfills can leak toxic substances into soil and natural water sources, leading to pollution and water contamination. The amount of e-waste that currently exists in landfills is stomach wrenching, but we can stop the bleeding by making environmentally conscious decisions when it comes to recycling electronics. Unfortunately, electronic devices often times contain poisonous substances like mercury, lead, and cadmium, which all need to be disposed of properly. So far, 25 states have passed legislation requiring individuals to recycle old electronic equipment. 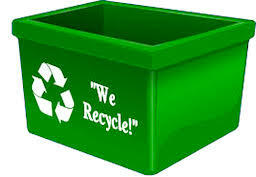 But regardless of where you live, you will find safe techniques for disposing of electronic waste. On Earth Day consumers of electronics may do something momentarily to lower their e-waste footprint on this planet, it’s typically not enough, however. A number of the materials used to create your convenient mobile devices can be recycled and reused, such as plastics, metal, and glass. There are computer recycling companies that exist out there that will actually liquidate entire businesses and their IT assets. Companies like this will refurbish and resell what they can, anything else can be recycled. Here are a few things that can help you make good decisions when it comes to electronic recycling. Both for your personal security and for the environment. First, be certain you totally erase all personal info. It normally is not as straightforward as deleting documents: There are ways to totally delete the drive, while another option is to destroy the drive using a hard drive shredding mechanism. The best way to recycle your e-waste though is to send it to a professional, or call one out to your home or office. Getting rid of your older technology safely is simpler than it used to be. There are lots of businesses that will collect it for you, there are charitable opportunities, and educational institutes that will take the dated electronics if they are at least capable of operating. Whichever you pick, be certain that you delete your own data from the device before you get rid of it. Also, many local computer retailers and repair shops will even take e-waste or older computers that they could refurbish and re-sell. In case your computer is not too old and still in great shape, there are a few community recycling initiatives which refurbish computers and supply them to nonprofit groups. Another way to decrease your e-waste footprint is to purchase green electronics or devices that have already been refurbished.